Rob introduced himself as an instructor and now an administrator for NOLS, the National Outdoor Leadership School which is based in the United States. He keeps in contact with groups operating in New Zealand and gives them support. He started off his presentation by referring to the number of people present tonight, multiplied by their years tramping i.e. a lot of experience. Then he asked for a hands-up of those who had experienced hypothermia in a party while tramping. He got Richard Wills to relate his story and took skeleton notes of salient points on the board while Richard was telling it. Rob then drew an outline of a human body and drew within what he jokingly referred to as the "inner child" which was the core temperature. He said the core temperature operated between 36.1° and 37.2°. He said the periphery wasn't this warm and said minimising this temperature gradient was crucial in allowing the body to maintain its core temp at operating range i.e. how you managed this gradient was how you managed hypothermia. 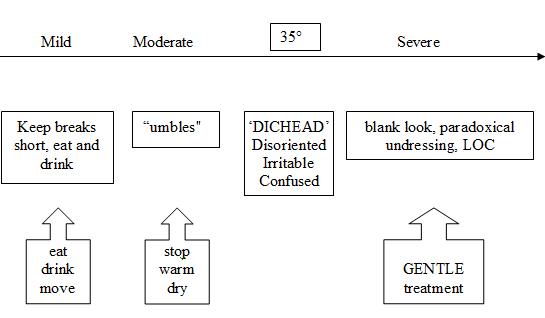 He then drew a continuum on hypothermia divided into 3 degrees of severity: mild/moderate/severe as treatment for each state was quite different. See the figure below. As Rob discussed points, he referred to Richard's story to illustrate this. He said not to get hung up on the sign of shivering ceasing as body temperature drops. It is not an important sign to notice. Rob also mentioned that in his opinion 40% of parties didn't carry the means to enable the treatment for moderate hypothermia i.e. shelter and a change of clothes, and a stove to make hot drinks etc. A rough guide to giving hot drinks is if they can hold it, they can drink it. Holding a drink in your palms shifts warm blood directly to the core - same for feet. When we are cold, we pee a lot of clear urine as the blood goes into the core so the kidneys increase urine production to keep the blood from becoming too thick. This means we can't use urine output as a guide to hydration. Dehydration means we will get cold injuries more easily as the body needs water to metabolise properly and thus produce heat. He said a lot of advances in treating hypothermia come about when wars take places in cold regions e.g. the Falkland war. Rob emphasized various points including the necessity to gentle handling when someone is in severe hypothermia as rough handling will trigger cardiac fibrillation i.e. cardiac arrest. He said it was good to do mouth to mouth but cardiac compressions were definitely a no-no! The idea of getting into a sleeping bag with someone or applying direct warmth was not feasible as this would cause blood to shift from the core to the periphery, thus dropping the core temperature further still. The peripheral blood would then recirculate to the core and because it was much colder than the core it would drop the core temperature even more. Rob said the right treatment for severe hypothermia is to insulate the victim from the ground, get them under shelter, into warm, dry clothing and gently roll them and position the bottom layer of a sleeping bag under them, zip it up and then have other bags on top. Due to cold water immersion, comes on quickly, unlike hypothermia. Some people can get a gasping reflex which leads to aspiration. The treatment is to get moving as the periphery is cold but the core is warm and glucose/glycogen levels are still OK. Peripheral loss of sensation, white, mottled, c/- itching, one form is trench foot - can occur in the tropics. Caused by continually wet feet, so prevention is to sleep with dry feet. The mechanism is lack of blood supply to the nerve tissue which leads to death of nerves. The treatment is to swing feet/arms and kneel on pack, raising and lowering knees to work the quads to shunt blood to the feet. He divided frostbite into 3 levels of severity: superficial (white dots)/partial thickness (hard to touch)/full thickness. The treatment was only to thaw out the part if it could be protected from refreezing as thawing causes water to leach out of the cells, like frozen fish that releases water. You could only thaw the foot out if you could maintain a water bath at 108° F (42° C). Finally, Rob summarized that he'd talked about 4 cold injuries and repeated what they were. I don't doubt that all of us learnt at least a couple of new things about hypothermia. It was very timely to have Rob come to talk to us again. We are indeed fortunate to have so experienced and effective a guest speaker on this topic. Thank you, Rob and Alan Ross for inviting Rob to do his presentation.